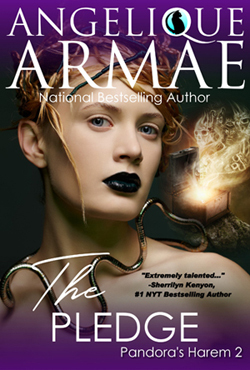 THE PLEDGE is the second installment in National Bestselling Author Angelique Armae’s Pandora’s Harem serial. Discovering I'm the personification of Pandora, yes, that Pandora, on the eve of my twenty-first birthday wasn't easy. But accept it I did, including all that came along with said revelation, even the three muscled warriors appointed to keep me safe from Chaos and her masterly crafted fits of disorder. To say she's a hindrance is an understatement. But as much as I appreciate having protectors, I'm not about to turn over my every inch of life to them. I need a pledge of loyalty first. My current run-in with the goddess Atalanta is a start. Apparently, the shifter has beef against being captured, though the blame of letting her loose in lioness form is not totally my fault. I didn't know my Spartans had bagged and dumped her in the living room of our apartment. Which was so not a good thing, because being who I am, letting the cat out of the bag was a given. Now a pissed-off lioness is skulking around my nine hundred square feet of living space and without my Spartans taking a side—me or the goddess poised to claw them—I can't put my trust in them. And with Moros—the Greek god of Doom and Death—along with his brothers Thanatos and Ker—knocking on my door, my Spartans better decide fast. Because without me finding my lost box, the hell I unleashed on earth thousands of years ago will never be reined in. And if Moros gets the box first, he'll destroy the one thing left inside—Hope. And every soul needs Hope to survive. And that includes me and my sexier than sin Spartans. *This is a reverse harem serial romance with one heroine and three male lovers. Each novella is a complete story, but the overall arc for the series plays out over the four novellas. Scenes, language, and situations are steamier and a bit darker than in my other books and may not be to the taste of all readers. 18+ only. © 1999-2019 AngeliqueArmae/JCMakk. All rights reserved.